Abide Therapeutics is a clinical-stage biotechnology company focused on transforming the lives of patients with serious unmet medical needs by developing first-in-class, small-molecule medicines targeting the serine hydrolase enzyme superfamily. This family of 250 enzymes regulates signaling pathways in the brain, digestive tract, and immune system. 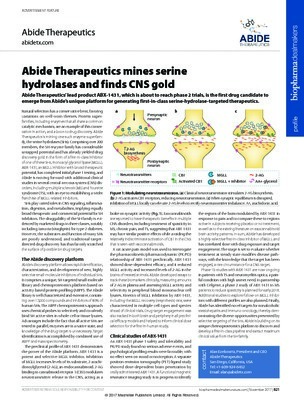 We use our unique platform that leverages the shared catalytic mechanism characteristic of the serine hydrolases to discover selective inhibitors from our highly tailored library. Our unparalleled understanding of serine hydrolase biology coupled with sophisticated chemoproteomic and metabolomic methods enables us to rapidly identify and validate new targets and efficiently develop both biomarkers and drug candidates for first-in-class clinical mechanisms. Our most advanced program is an inhibitor of MGLL, an enzyme that regulates neurotransmitters. Dysregulation of neurotransmitter tone is a general feature of brain damage in several diseases. The initial indications for our MGLL inhibitor are Tourette Syndrome, NMO, and MS spasticity. We see these as gateway indications, data from which may lead to other neurology indications such as Parkinson’s disease and ALS. We are also developing follow-on MGLL candidates and identifying inhibitors for new serine hydrolase targets for liver disease and oncology.